When I was ordering the guineas, noticed somewhere in the order form that you can include "pinioning" (sp) for $0.65 each, IIRC. It didn't sound like much, but I decided against it. I remember how much fun our neighbor's guineas had "screaming and flying" all over the place! They appeared to be really enjoying life! You can try them unpinioned first, and then change your mind if things get too rowdy! Hi Solani, I'm just now reading your post. My computer went awol and as ya know, just been back a couple days. My 75th birthday is April the 7th. I have a ton of ideas many of which I've posted over the years... Ideas are great but I also have so much I need to actually get done. Yes, such a good idea to get the chickens. My idea would be, have healthy hens and enough roosters to keep it all going. Eat mostly the eggs and an occasional chicken for the pot. Fertile eggs are such good nutrition. Wishing ya all the best in your preparations. Gardening With Chickens by Lisa Steele is full of good ideas and color photos on how to garden in ways that are compatible with poultry, and how to raise poultry in ways that are compatible with gardening. The guineas I ordered won't be here until May, so there's time to learn about them. For example, they apparently eat less greenery than chickens, or do they? Does anyone know what to feed the babies for the first few weeks, while they're in their little box with the heat lamp above? All poultry in confinement are "obligate vegetarians," meaning that they'd prefer to chase live protein than eat mashed grains. Guineas need a higher protein feed than chickens, but do quite well on regular poultry diets. Keets need a 24% to 26% protein ration as the starter feed. The protein level should be reduced to 18% to 20% for the fifth to eighth weeks. After eight weeks, the keets can be fed a 16% layer mash. We make a home-made mash that is 1/3 black oil sunflower seeds, 1/3 oats, and 1/3 miscellaneous greens or leftovers. Then besides grazing outside the pen, they also have access to a compost heap inside the pen with things such as mushy pumpkins, celery leaves, rotting apples from adjacent trees, their own crushed egg shells, garden clippings, etc. I strongly recommend that poultry owners who are interested in prepping give consideration to bulk storage of oats so there's always a basic component of the mash on hand that contains its own vitamin E content and keeps long-term. Very good to have on hand in weather that doesn't permit grazing, at the very least. Most commercially produced mash contains GMO corn, which we don't allow here. Thank you so much for (# 112) the guinea information. I had been looking and wasn't getting a lot. This is the best starter I need. One friend last year said, when I was contemplating chickens, to make sure even when they're still quite small, to give them a little stinging nettle greens every day, presumably for the minerals. I'm going to see if the guineas will accept it also, as they are similar, and that stinging nettle patch is finally growing, and maybe a bit more than I had anticipated. 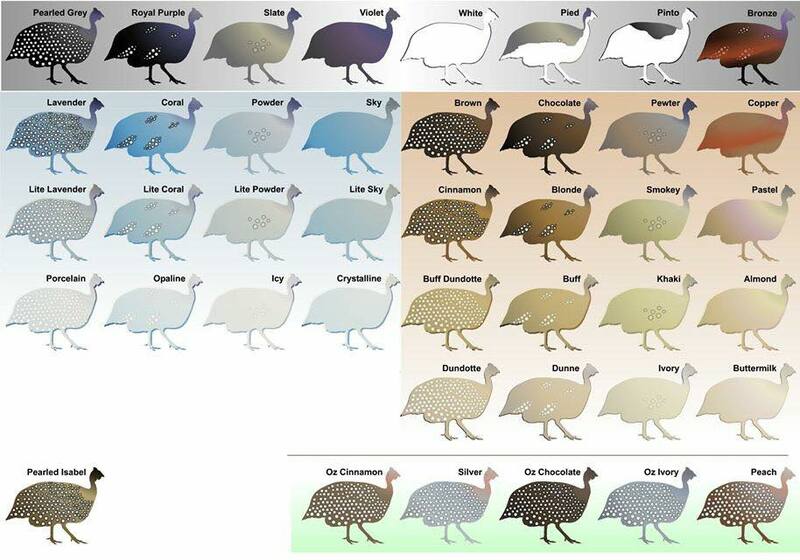 And, yes, there are many types/colors of guineas. I ordered mine from a place in Iowa, "guineafarm.com" is their website, and they do have a lot of variety. The owners/,managers are the second generation, and they have had experience raising the birds as children on the farm. they have had experience raising the birds as children on the farm. Nettle tea seems like a good idea. If it disagrees with them, they can simply pass it up and no harm done. Reading your post reminded me that comfrey is also a biodynamic accumulator, and would be full of minerals too. They are beautiful and look like happy girls!